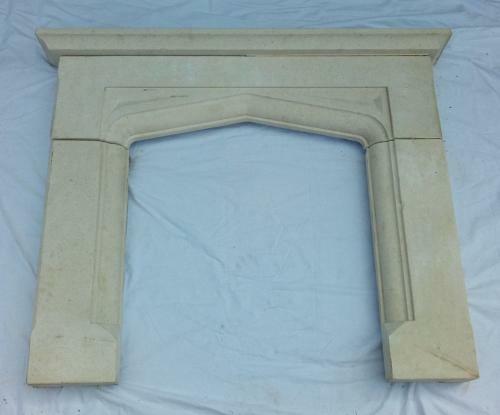 An attractive, reclaimed, Gothic style fire surround made with composite stone. The fire is approximately 25 years old and has a lovely design with a Gothic style arched opening and carved mouldings. The fire has an attractive pale colour, suited to most interiors, and would be perfect for surrounding a wood burner or fire basket. The fire is reclaimed and has some slight damage. There are a few small chips and knocks especially to joints, edges and mouldings, please see pictures for details. The fire has some slight scratches and marks from use. The fire has a very attractive design with influence from the Gothic era. The surround would look fantastic within a period home but is also suited to a more modern, minimalist, home due to its pale colour and stylish design. A very desirable and attractive fire.